I stopped carrying a conventional point-and-shoot digital camera on a daily basis around the time the iPhone 4 or 5 became available because at that point, the iPhone was “good enough” for most of the kinds of casual photography I do. The exception to this rule was when I knew I would want to have good optical zoom. Then, and now, I’ll take a digital camera with me. One of the biggest issues I’ve had with digital cameras (conventional and smartphone) over the years are photographs of certain bright red objects in sunlight: Mostly flowers. The resulting photograph always seemed to be “blown out” to me resulting in a bright red blob with defined images but very little details visible within the red blob. A skilled photographer could probably use of the apps for iOS or Android to carefully adjust white balance and other settings to get a good photo of these bright red objects. But, I’m not a skilled photographer. All I want to do it take out my phone and snap a photo of something that interests me. So, I was happy to find in the Fall of 2016 that my then new iPhone 7 Plus did a pretty good job of photographing these bright red objects without any photographic adjustment fussing on my part. I decided to skip upgrading the 7 Plus to the iPhone 8, 8 Plus, or X this year. However, I did upgrade my two year old Nexus 6 to Google’s new Pixel 2. The Nexus 6 has a good but not great camera (that said, its low light photos are much better than the iPhone 7 Plus’) but early reviews of the Pixel 2 and 2 XL reported their cameras were much better that the 7 or even the new Apple iPhone 8 series. So, for the past 24 hours, I’ve been trying the Pixel 2’s camera in a variety of conditions (night, dawn, bright daylight, indoors, outdoors, etc.). The pair of photos above were taken within a minute of each other using an iPhone 7 Plus (left photo) and Pixel 2 (right photo). In my opinion, both photos are much better compared to photos taken with devices from just a few years ago. 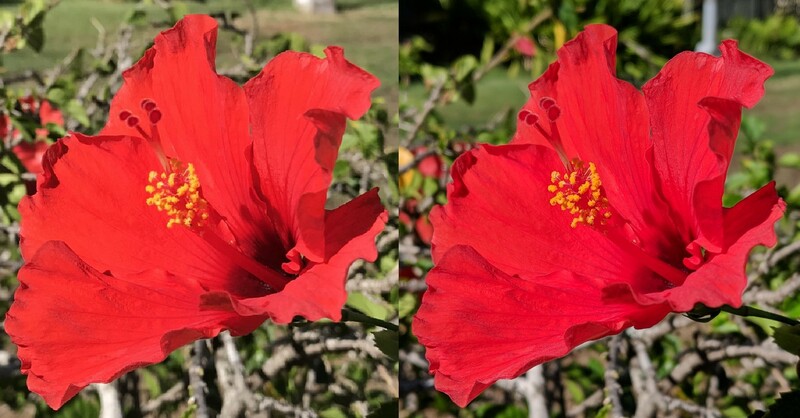 However, I think the Pixel 2’s photo (right) shows more details which are especially noticeable to the left and right of the pistil. And, the shadows at the base of the pistil seem to have more variation in the Pixel 2’s photo and looks more like what I saw with my eyes at the scene. I’m pleased with the Pixel 2’s photo of this bright red flower. And, in general, I think the Pixel 2 takes excellent photographs that are as-good and, perhaps, a bit better than the iPhone 7 Plus. And, like the older Nexus 6 I used, the Pixel 2 takes very good photos in low light situations. Couple of notes: 1. Apple’s iOS 11 stores photos in the new HEIC format. I didn’t know how to quickly deal with that file type on the Chromebook I’m using to write this. Fortunately, PetaPixel has a helpful article that let me to the free web-based heictojpg.com site that let me convert the HEIC file to the more common JPEG image file type that I could use in an editor. I also didn’t know a Chrome OS or Android editor that would let me set two photos side by side. However, I found the free ImageCombiner Android app that could deal with this task for me.